The last week and a half, we have been doing nothing but preparing for the CDL exam. 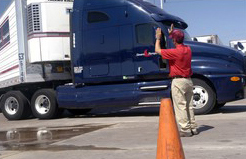 By the way, we now have a free online CDL practice test. Basically, we've been rotating between the yard skills test and the road course so we could be as prepared as possible. We have two road trucks...the red truck and the white truck. One of them is a 9-speed and the other is an 11-speed, so the shift patterns are different. Also, since they have different transmissions, they are both a little different on techniques for shifting them. It was determined last week that we would be using the white truck for the road test. No problem. But since this decision was made, that is the only truck we've been doing the practicing in. I started getting very comfortable with the white truck and felt very confident. We started out Wednesday morning very early so we could get a lot of drive time in. Well, right before lunch time, another student was driving. He didn't do anything wrong, but all of a sudden the truck started to sputter and make a terrible noise. He lost all power. As we slowed, he downshifted, only to have the noise return with no acceleration. Eventually, after determining we had a major problem, he pulled the truck to the side of the road and turned the truck off. We opened the hood to see if we could determine what was wrong and we found nothing out of sorts. There were also no warning lights on the dash indicating a problem. My instructor started the truck up again and gave it a little rev. The result was a bad sputtering sound with dark black smoke coming out of the exhaust. This truck was in no shape for test day. One of our school's mechanics came out to pick us up. Of course, when he got into the truck and started it up, it ran just fine. Figures. They took the truck back to the school and called a local shop to take a look at it. They are now unsure if we'll be able to use the white truck for our road test as they have no clue what the problem is. Crap! It has been about a week since I drove the red truck. I'm not used to the shifting pattern and have become very comfortable with the white truck. I was able to take the red truck out for a quick spin around the course and did very well, so I'm not as nervous. However, a couple of my classmates are less than happy about this. They aren't sure if the white truck will be ready by test day or not. Hopefully it will be, but if not, I still feel prepared. What a thing to happen before test day, though! My yard skills started out pretty poorly this week. On Monday, I was not on my game. I was coming in crooked, not turning the wheel when I should have been, and just sucking it up all together. I even hit a cone on my measured right turn, which I never do! I'm not sure what the deal was, but it didn't instill much confidence in me coming up on test day. Thankfully, when Tuesday rolled around, I was back in the saddle again. I've said it before, and I'll say it again; The set-up for a back is equally as important as the backing itself. On the course, we take a sharp right turn, go straight, then make a sharp left turn to set up for the 45 degree back. After the sharp right turn, at idle speed, as soon as the truck is straight, I would count to 5 before I made my left turn. I originally started out by counting to 6, but changed that about a week ago as I found five seconds works better. Well, after having some problems, I went back to the six-second count. This made a world of difference! Just one second made my back that much easier. It's tough to explain in words, but the smallest change in the set-up makes a huge difference. So if you are currently working on your backing skills, be sure to have the exact same set-up every single time, then adjust if you have problems. I can't stress enough how important a proper set-up is before backing. The rest of the week went very well in the yard and on the road. I'll tell ya, I'm getting pretty good at running through those gears. I can't wait until I get on with a company and they teach me how to shift without double clutching. The progress I've made in just a few short weeks completely baffles me. Bring on the test!